Anyone else having this issue? 4th panel on the 3rd painting will not complete even though I've filled the required paint buckets needed to complete panel. Hello, UGAGAL. I sent you a Private Message regarding your concern.Please check your Inbox. Thank you. 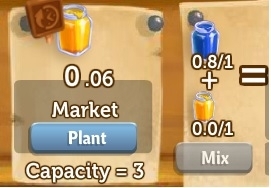 I can`t fill pots or upgrade. I have made 73 Jostaberry jams and the count will not increase from 9! Just this morning (and I've had other problems in the past couple of days) 1) took me two times each to upgrade my blue and yellow paint. 2) Got to the 4th panel of the 2nd painting - after my first fill, it said I had 1/3, filled a second one, said I had 0/3, filled a third one, still 0/3. 2nd painting, 4the panel -- yellow won't increase despite harvesting many, many plots. 4th panel on first painting for me. I fulfill my task and it registers it as 1/3 on the panel then reverts to 0/3. At this rate I should be well into second painting. 2nd painting, 4the panel -- yellow won't increase despite harvesting many, many plots. Have wasted many plots harvesting different yellow plants to get this to work. very disappointed! I have the same issue. Glad I noticed this before I harvested any more. 4th panel, second painting with the same issue. Glad I noticed this before I harvested everything . Can you get the rest of us some help ? Same issue. Please fix the bug! I contacted support, waiting on an answer. I don't know if it matters which panel you are on. Because I'm seeing many others having issues where the paint isn't counting. It just started happening to me this morning and I'm on painting 6 panel 2. I'm having the same problem also. I wander where all our paint is going to? Hope they know what we missed out on paint and prized crops. Mine were working when I logged in today. Now ALL are broken. No paint is being added to any of the buckets. Yep, cleared cache and all that mumbo jumbo junk, which doesn't work. Time for the weekly quest? Waiting for that too. I guess I'll do my rich order board in the meantime. same here ! And I did not get the quest yet ! What is with the secret answer??? If everyone is having issues why is the answer not shared?? why would this moderator private message an answer? That is crazy... So many screw ups lately and it is very annoying that it is so hard to get any support.. I have had big issues not being resolved.. They probably wanted their user ID, to help them. Not a good thing to post that here.